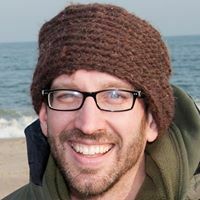 This spring, due to my teaching schedule, I missed the botany lecture for my Virginia Master Naturalist class. 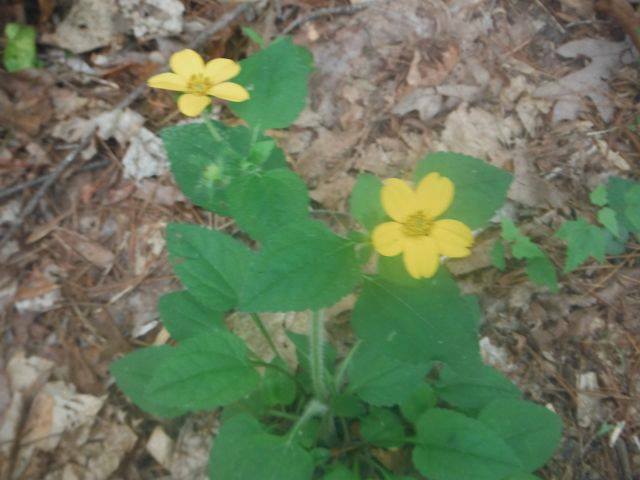 In order to make up this lecture and complete the course with my classmates, I elected to explore a bit of phenology and hike the length of the North River Gorge Trail and report back with a photo essay on what flowers were present on the first of June, 2013. The following set of Facebook posts is my report back from this hike. 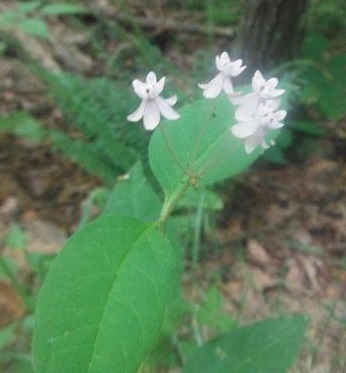 In each post, I will present a photo, and identification, and a description of where on the trail and in what setting I found the flower or plant plus any additional information I had. Overall, it was a beautiful day in terms of having mixed sunshine and clouds, moderate humidity, and temperatures in the mid-80s . . . . a great day to be in George Washington National Forest with Chip and Quincy. We entered the trail off of Forest Road 95 and Stokesville Rd. 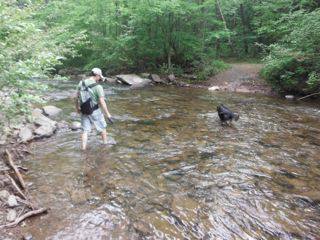 and hiked south up to the last river crossing before encountering the North River Campground area. The entire trail is fairly flat and wide, being a gated forest service road accessible to hikers, horses, and cyclists. There are several river crossings that provided both an opportunity to explore the aquatic environments as well as providing a great opportunity to cool down. 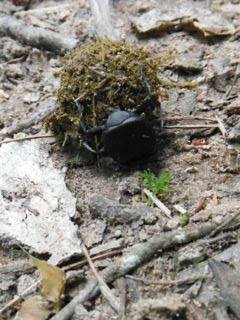 The trail meanders through a mix of oak/maple tracts and then pine forests with one or two small meadows included. Our field guide of choice was Newcomb’s Wildflower Guide and its handy three-part key classification based upon flower type, plant type, and leaf type. Making a decision about each of these three flower components provides you with a three digit number that then refers you to a section in the book, drastically narrowing down the amount of book searching required. 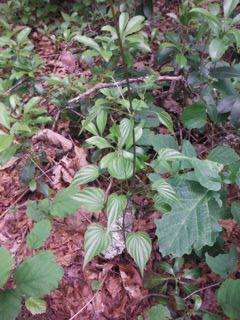 Our first encounter was with False Solomon’s Seal, a flower with six parts and leaves alternate and simple. It was the first of several flowers from the Lily Family and a reminder that we were out just at the crossover between spring and summer with several flowers apparent from each season. Next was Barren Strawberry of the Rose family (of which all strawberries are members). This is a plant that often fools me when it appears in our own backyard, making me think that we have a wild edible strawberry appearing, but the Barren Strawberry has dry and inedible fruit, not to mention its indicative yellow flower. 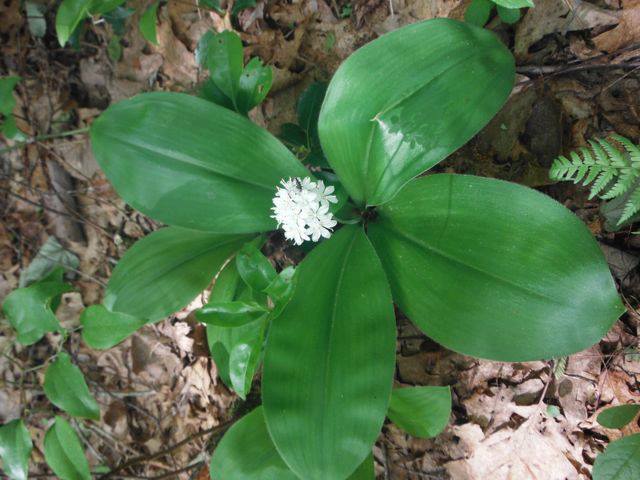 Our second member of the Lily Family was the White Clintonia. This flower is very much like a cultivated garden flower with it’s dark green, simple basal leaves. 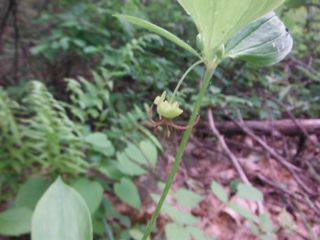 Newcomb’s indicated that this Clintonia appears in rich woods over a certain swath of the east coast, leading us to feel that we were seeing something not as common as the first two flowers. 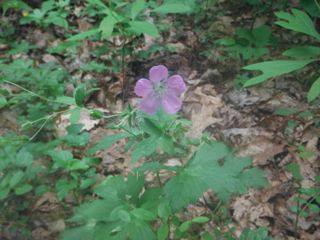 Our next flower, the Wild Geranium, is a special flower to me because it is one of the flowers appearing in the elevations of Colorado where I first became a naturalist, working at an environmental education summer camp. Kind of like seeing the same constellations wherever you are at night, seeing the Wild Geranium is like seeing an old friend – a familiar “face” in an area of high levels of biodiversity. Obviously from the Geranium family, this flower is also known as the Spotted Cranesbill, which was a new piece of information for us. It is readily identifiable by its deeply cleft palmate leaves. 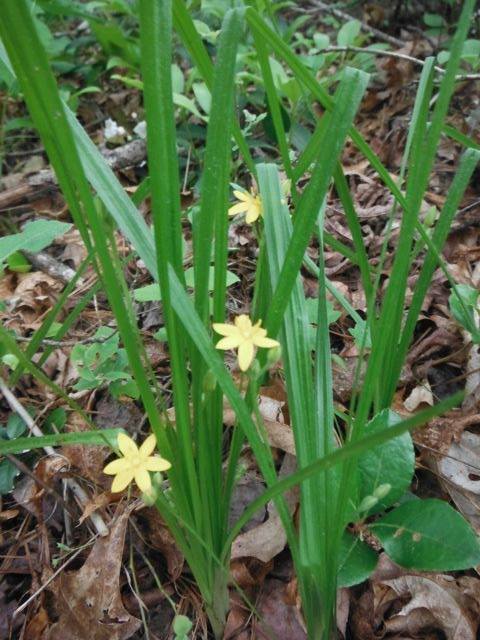 Our first member of the Composite Family was the Golden Star that happens to be of the species Virginianum. This is a popular cultivated ground cover that is also a native species, making us think about whether or not it appeared where we found it by the creek naturally or via introduction from horse poop. 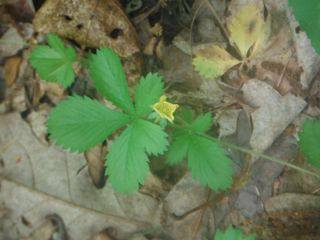 Another Lily (and another flower with a species name related to our state – virginiana) that was striking in its subtlety was the Indian Cucumber Root, noted for its distinctive whorled leaves arrangement and nodding blossom. We will have to look in late summer for the berries on this one which are to be a dark purple. 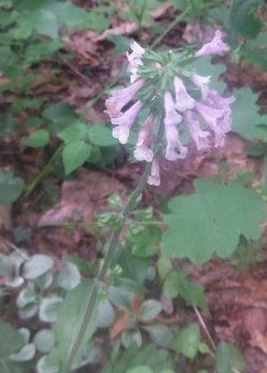 Intrigued by its name, I did a quick online investigation and found information (http://www.mbc.edu/academics/wildflowerstudy/mono/Liliaceae/Medeola.html) that this flower is a) the only species in its genus, and b) has a peppery, white root that can be eaten raw but that care should be given to not over-harvest. 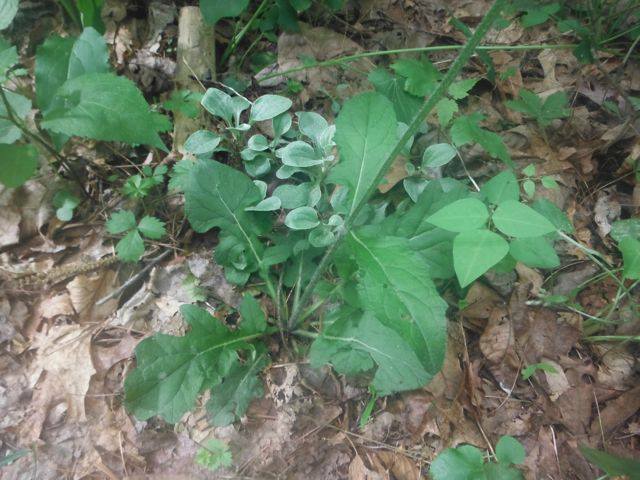 On the theme of things edible, we also came across a new favorite of ours – Wild Yamroot of the Yam Family. This interesting plant starts as a self-supporting plant with unique, heart-shaped leaves palmately veined connected to the main stem in a whorled fashion but then grows into a vine with the leaves appearing in alternate fashion. 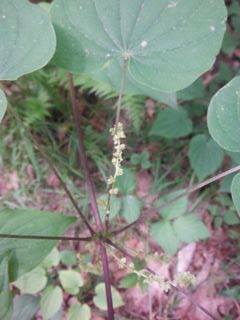 This particularly species is D. quaternata, the southern relative of the Dioscorea villosa described by Newcomb. 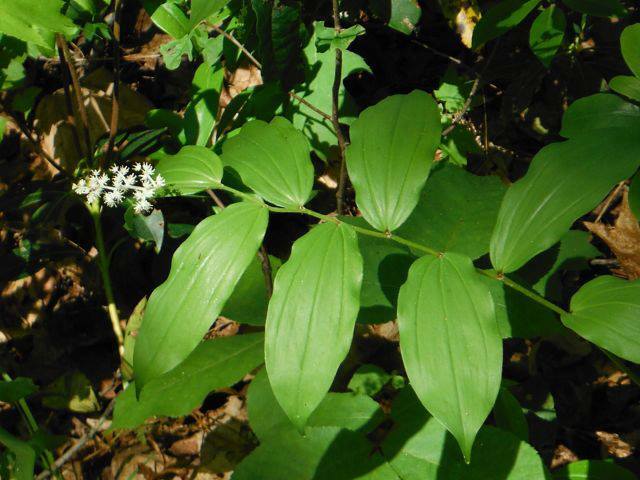 A quick online search (http://mason.gmu.edu/~sy/projects/plant/plant.htm) revealed a more interesting use history of wild yamroot (in particular the D. villosa species) as medicinal for menstrual cramps by Native peoples. Despite its common sounding name, eating the root raw will induce vomiting. Note the subtle flowers. 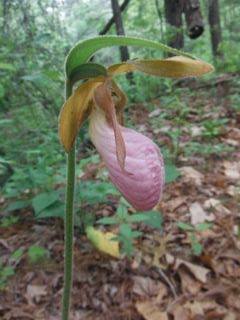 We were very lucky to catch the tail end of a cluster of Pink Lady’s Slippers from the Orchis Family. Chip reminded me how these are highly evolved flowers particularly designed for pollination by creating a one-way passage for insects interested in feeding on their nectar. 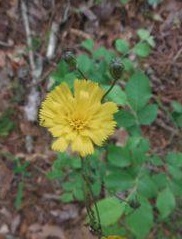 A fun discovery was the flower of the Rattlesnake Weed, another member of the Composite Family, part of the Hawkweed group, and very dandelion-like in its blossom. 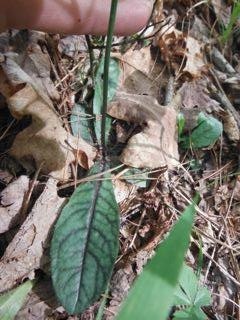 This was a fun discovery because we had been seeing its distinctive basal leaves with their vivid green and purple veins all spring and were having a hard time distinguishing this plant from similarly leaved ones in the Rattlesnake Plantain group. 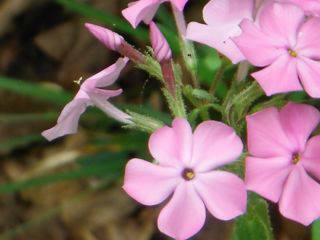 Familiar to many due to its common appearance in cultivated form is a member of Phlox Family, the Downy Phlox. We really liked the close-up picture of the swirled bud. Nature generates fascinating design elements, doesn’t it? Next up is the Yellow Stargrass of the Amaryllis Family that looks grasslike but produces a pretty, six-part yellow flower that blooms all season long, so keep your eyes peeled for this one throughout your hiking season. While there were a few other plants, ferns, and flowers identified, I will end this phenology display focused on wildflowers with two that are sort of stumpers to us in that we have not been able to identify them with Newcomb’s (which doesn’t mean they aren’t there . . .) and would like to give you a chance to suggest an ID. … . 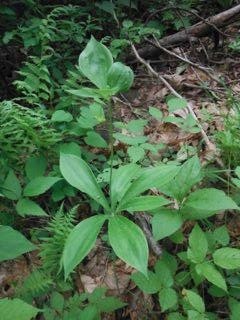 . . our guesses are some kind of Lobelia for the purple flower and a member of the milkweed family for the cool looking upwards and downward bending flowers. Lobelia leaves? … Lyre leaved Sage ? 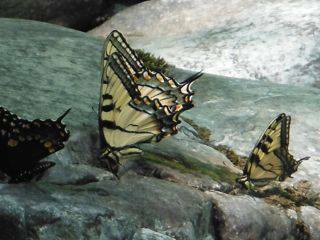 Finally, a few other naturalist sightings like these Eastern Swallowtail Tiger butterflies and a dung beetle rolling some horse manure off the trail for egg laying purposes. I can’t forget to give credit to my hiking side kicks . . . Chip and Quincy! 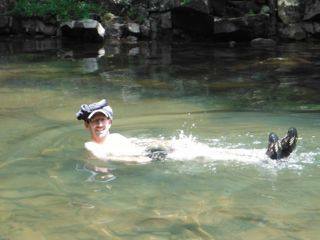 And a visit to the North River Gorge Trail would not be complete without a jump in the river! October 24, 2013 in Nature Notes.